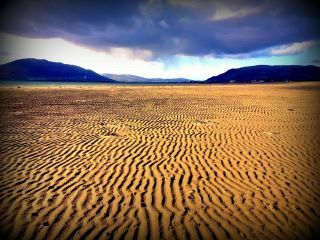 Sand Patterns on Cranfield Beach, with the Cooley Mountains on the left, and the Mourne Mountains on the right. 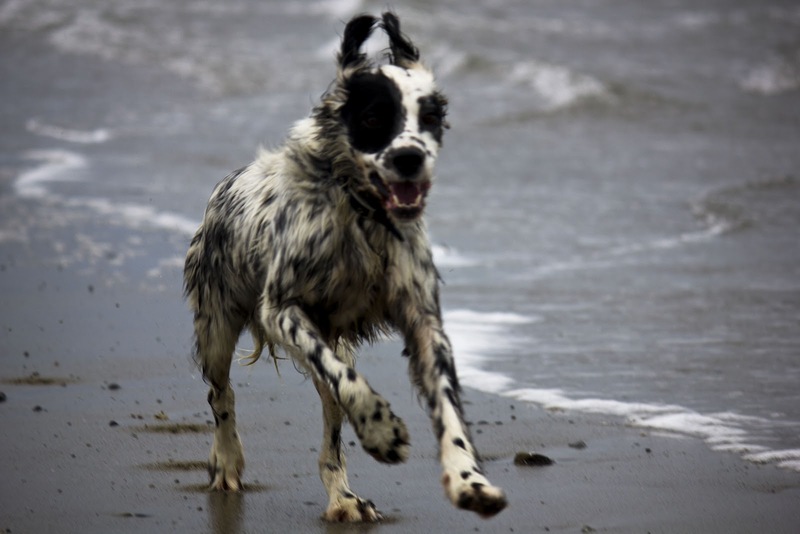 My dog, an English Setter, loves the beach. He runs and runs to his heart content, and still hasn’t cottoned on to the fact that the birds out on the water will get away from him before he makes his splashing path out to them! 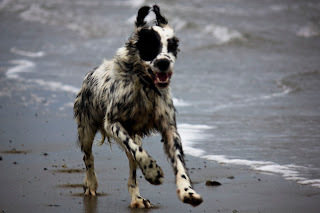 As a re-homed dog, it gives me great pleasure to see him enjoying his freedom, especially as I know that it is so different to his previous life. It isn’t just my dog that gets the benefit from the sea air, though. I love that feeling of getting away from it all, where often the only sound is from the water (OK, and I admit, usually the wind!) But what is a bit of wind, when you’re wrapped up warm. Have you ever noticed how you feel happier after being at the beach? Apparently it is to do with the sea air being charged with negative ions. These accelerate our ability to absorb oxygen, whilst helping to balance levels of serotonin, a body chemical linked with mood and stress. This means you finish your walk feeling more alert, relaxed, and energised. So where are my favourite places to head? Without a doubt, I take a trip out to Cranfield beach, where I follow the curve of the shore around to Greencastle. From here I take in the view of the Cooley and Mourne Mountains, guarding either side of Carlingford Lough. If I have the time, I head further on around the coast to Murlough Sand Dunes, just outside the seaside town of Newcastle. This Nature Reserve has a beautiful network of boardwalks that wind through the Dunes before bringing you out onto Murlough Beach. 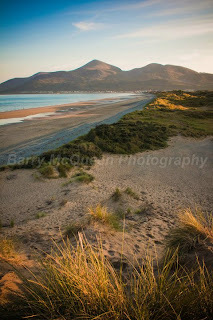 A fantastic vista of the Mourne Mountains sweeping down to the sea, really make this a spectacular walk. Arriving back to my car, I’m relieved when I’ve remembered the towel for my dog – it’s good to remove the excess water and sand before the journey home. Another item I like to bring is a no-splash water bowl for the dog – all this running about is thirsty work after all! A definitive online guide to walking in Northern Ireland. 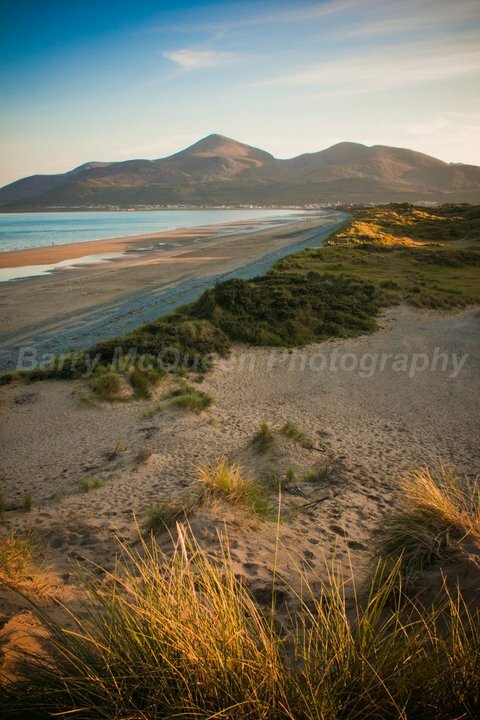 Beautiful photos of Northern Ireland for sale.